Photonics in Switching provides a broad, balanced overview of the use of optics or photonics in switching, from materials and devices to system architecture. The chapters, each written by an expert in the field, survey the key technologies, setting them in context and highlighting their benefits and possible applications. This book is a valuable resource for those working in the communications industry, either at the professional or student level, who do not have extensive background knowledge of the underlying physics of the technology. Research scientists and engineers in fiber optics and telecommunications, and advanced students in these areas. Multiwavelength Switching and Interconnection Networks. Optical Code-Division Multiple Access. Space Division Switching. Free-Space Interconnection Techniques. Switching Systems-Time and Wavelength Division. Photonic Fast Packet Switching. 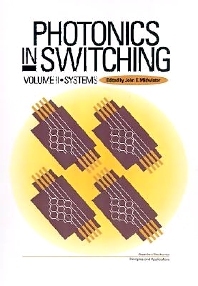 Multi-Dimensional Switching Systems. Index. Chapter References.